We really love PBSKids in our house. They have such fun, educational shows that Matthew absolutely loves. 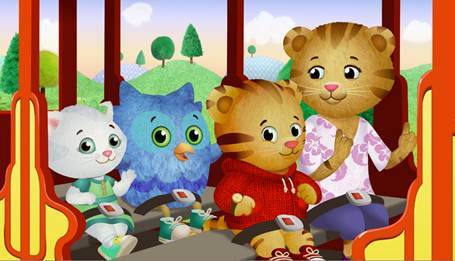 I'm super excited for the new show, Daniel Tiger's Neighborhood, which will begin airing Labor Day, September 3rd. It looks to be a really great show. Matthew loved the video preview above. Check your local listings for times. You can follow Daniel Tiger's Neighborhood on Facebook and Twitter. This fall, Daniel Tiger’s Neighborhood, an engaging new animated series for preschoolers, will pounce onto PBS KIDS (check local listings). The first television show from The Fred Rogers Company since Mister Rogers’ Neighborhood and inspired by the enduring legacy of children’s television innovator Fred Rogers, the vibrantly colorful new program invites viewers to explore the imaginative Neighborhood of Make-Believe with 4-year-old Daniel Tiger and his best friends as they learn important skills and strategies necessary for growing up. Daniel Tiger’s Neighborhood also features an activity-rich website with free, interactive games for preschoolers, online resources for parents and teachers and other valuable and fun cross-platform content. Below is a conversation with the series’ Executive Producers, Kevin Morrison, Chief Operating Officer of The Fred Rogers Company, and Angela C. Santomero, Co-Founder of Out of the Blue Enterprises. Q. After so long, why return to Mister Rogers’ beloved neighborhood now? K.M. A few years ago, The Fred Rogers Company set out to produce a new series for a new generation of children. We developed a number of different program ideas, but Daniel Tiger’s Neighborhood, based on characters familiar to generations of children, was always everybody’s favorite. Although the series uses the latest production techniques and looks beautiful, its essence is based on Fred Rogers’ timeless techniques. Q. What made Fred Rogers a pioneer in children’s entertainment? How is his trademark approach evident in Daniel Tiger’s Neighborhood? A.S. Fred Rogers has been both an inspiration and a major career influence for me. In effect, he created a blueprint for children’s television that works. And, with this new show, we embraced the great level of respect that Fred had for children, the way he communicated with them, his gentler pace and his “interactive” inclusion of his young “neighbors” at home. K.M. Fred was a pioneer in the way he used the camera. In the 50s and 60s, children’s presenters were addressing an audience. When Fred spoke, there was no doubt that he was talking just to you. At that time, this was revolutionary. Q. Are there elements of Mister Rogers’ Neighborhood in Daniel Tiger’s Neighborhood? How is the new series fresh and different? A.S. There are nostalgic nods of “love” to Mister Rogers’ Neighborhood throughout each episode of the new show. The characters are the children of the beloved puppets from Fred’s Neighborhood of Make-Believe and our series star, Daniel Tiger, is the son of Daniel Striped Tiger, Fred’s first puppet. Like Fred, Daniel wears a red sweater and sneakers and speaks directly to preschoolers to include them in his day. Fred’s music can be heard, in some cases as cover songs, and in others as inspiration for new musical strategies. K.M. That being said, this is a brand-new series with a very different look and feel. It’s animated instead of live-action and focuses on the adventures of a 4-year-old and his friends in an exciting and very different Neighborhood of Make-Believe. Q. How have Fred Rogers’ groundbreaking concepts been updated to appeal to a whole new generation of young viewers and their parents? A.S. Fred’s curriculum is timeless. But our approach to his curriculum was planned with today’s preschoolers in mind because we wanted to make sure that we were reaching them most effectively in terms of appeal and learning. Q. Why choose animation instead of live action? A .S. We wanted to animate the Neighborhood of Make-Believe to put a unique spin on the “neighborhood” with this new series. Plus, animation allows us to make our stories visual – for example, we can let viewers peek inside Daniel’s colorful imagination. K.M. We considered live action, but animation gives us powerful tools for storytelling. Our research-based curriculum is wrapped inside engaging stories for the very youngest children. Q. How did you develop the characters for the show? A.S. Although the characters were initially based on the puppets in Mister Rogers’ Neighborhood, our goal was to give them a multi-dimensional feel so they’re true to the personalities of preschoolers. K.M. We want children to feel that they’re friends with the characters – and hopefully aspire to be like them so they are engaged and learning the strategies right alongside Daniel and his cohorts. Q. What role does music play in Daniel Tiger’s Neighborhood and why do you think using song-based strategies is so effective? A.S. Music is an integral tool for learning in Daniel Tiger’s Neighborhood. Our musical strategies are unique and catchy. Parents and children will be singing them all day long! For preschool viewers, music propels the curriculum forward, ensuring that they truly understand why a particular strategy was needed and how it helped our characters. K.M. And couching a key strategy in an easy-to-remember song makes it very simple for parents to help their children incorporate that new skill into their daily lives. Q. Recent research shows that early development of solid social and emotional skills leads to success later in life. How did this help inform the creation of the show? A.S. Pro-social values have been shown by numerous studies to be imperative to later social and academic success for children. Daniel Tiger’s Neighborhood helps hone the skills that prepare young viewers to be optimal learners in kindergarten and beyond. Encouraging children’s self-confidence, combined with the ability to regulate their impulses and appreciate adult guidance, gives them the solid foundation they need going forward. Q. How can Daniel Tiger’s Neighborhood be a useful tool for parents and preschoolers beyond the television screen? A.S. Moms and dads who have previewed the show have called it “A user’s guide for today’s parent!” We’re finding that parents and caregivers are writing down our strategies and using them when they need to encourage their kids to be patient, when they’re nervous about a new experience or when they’re disappointed. We hope to have a useful strategy for every situation a parent could find themselves in!